Today I went out for breakfast. Try as I might I have a hard time with all the breakfast goodies like hash browns and bacon. There are also unexpected pitfalls. The milk was full fat and the piece of toast was larger than expected. Even though I did not eat the hash browns and gave away some of the bacon and had my egg poached so there wouldn’t be extra fat, I still ended up with more calories at breakfast than usual. To counteract this I made null soup for lunch. This is a recipe from my old Weight Watchers days. Under one of the old programs this soup has zero points. The soup is warm and filling. It can be made with chicken or vegetable broth. The vegetables can be anything you have handy as longer as they are not starchy vegetables. I used onion, carrot, celery, mushrooms and broccoli. Enjoy! 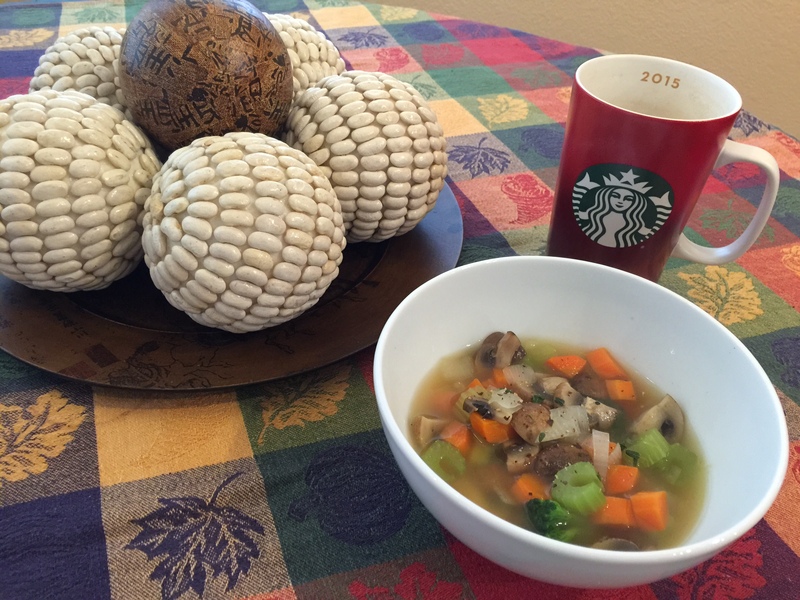 This entry was posted in Vegan, Vegetarian and tagged broccoli, carrots, Celery, Lunch, mushrooms, soup, Vegan, vegetarian. Bookmark the permalink.